Editor’s Note: Today we continue our discussion of better email productivity on the Day-Timer Blog with Laura Stack, the Productivity Pro©. Etiquette seems to be a strong theme of your webinar, are people sloppy with their email? Laura: Don’t you wish every person who received a new email account had to agree to follow certain “rules of engagement”? I’d love to see a master protocol list to govern what you can and cannot do. Here’s a sample of what I’d include on the netiquette list. What would you include? – Understand that informal doesn’t mean sloppy. If your coworkers use Blackberries or text pagers to communicate internally, use the commonly accepted abbreviated language. When communicating with external customers, however, always follow standard writing protocol. Your email message sends a message about you and your company, so normal spelling, grammar, and punctuation rules apply. – Keep messages brief and to the point. Just because your writing is correct doesn’t mean it has to be long. Make your writing as concise as possible. Nothing is more frustrating than wading through an email twice as long as needed. Get right to the point; concentrate on one subject per message as much as possible. – Use sentence case. USING ALL CAPITAL LETTERS LOOKS LIKE YOU’RE SHOUTING. Using all lower case letters looks lazy. For emphasis, use the asterisk to make words * really * stand out. Also, don’t use a lot of colors or graphics embedded in your message, since not everyone uses an email program that reads HTML. Without HTML capabilities, colors and graphics show up as garbled code. 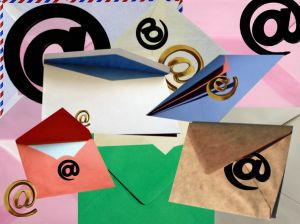 – Don’t use email as an excuse NOT to communicate. Don’t forget the value of face-to-face or even voice-to-voice communication. Email communication isn’t appropriate when sending confusing or emotional messages. Think of the times you’ve heard someone in the office indignantly say, “Well, I sent you an email.” If you have a problem with someone, get up and walk three doors down to find that person and have a conversa tion. Don’t use email to avoid an uncomfortable situation or to cover up a mistake. Laura Stack will share more insight and secrets on email productivity in an upcoming webinar on “Email Communication” hosted by Day-Timer on Monday, September 27. Don’t miss this valuable hour, register today. Great comments, L. and Kristine. Thanks for contributing! The only thing I would add is to remember that we are dealing with the internet, and that once things are sent, they are on the net forever. Therefore, *Never* include any language that you would not want on a postcard in your emails. As well as please do people the courtesy of not sending any forwarded messages that may get your recipient in hot water with management. There is a time and a place for that risque joke, but the work email system is not one of them. great rules of thumb; #1 is extremely important!! the one other thing i would add is, be selective when asking for a read receipt and only use when it’s a must.